Is your garbage disposal giving you problems? 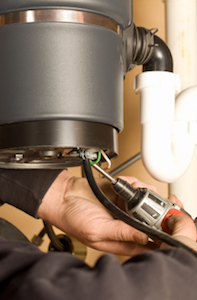 Let SJS Handyman install a new garbage disposal for you. We’ve got the experience to get the job done right. Is your garbage disposal just jammed or does it need to be replaced? Sometimes a garbage disposal may not be completely broken but just be jammed. If we find that it’s jammed, we can unjam it for you. If it needs to be replaced, we can take care of that too. Either way, we’ll get you up and running with a working garbage disposal again in no time. If you need a new garbage disposal installed in San Marcos or nearby please call 760-580-5224 or submit a free quote request today. We’d be happy to take care of you. Handyman Tip: A jammed garbage disposal usually makes a humming noise when it’s turned on. If you have the “allen” tool that came with the garbage disposal you can insert it in the bottom center of the unit and turn the motor to clear the jam.